Share this product and receive a $1.78 sharing discount. As featured in the April 2006 issue of In Style magazine! Take this platter to the engagement party, bridal shower, rehearsal dinner, wedding, anniversary, etc. and have all the guests sign! The Wedding Signature Platter or Wedding Signature Guest Book Platter is a creative new approach to the traditional wedding guest book. On the day of your event rather then having your guests sign a standard store bought guest book have them sign a unique hand painted personalized Wedding Signature Platter created just for your wedding. 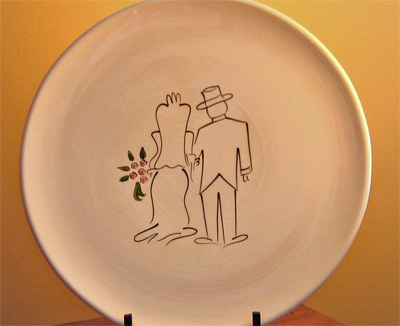 Once signed the Wedding Signature Platter needs only to be baked in your home oven to seal on the signatures. Complete instructions are included. Our Ceramic Guest Book Platter makes a wonderful keepsake for future generations. 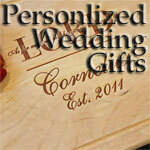 The hand painted Platter has been created in Louisiana and packaged safely for you or your loved one. Guests sign the platter at the event with a special Pebeo pen. Purchase includes: ceramic platter, black fine point Pebeo marker, and complete instructions for how to preserve your signatures and use for years to come.